The Jeep & IH Dana Spicer 20 is one of the most respected transfer cases on the trail and street. Professional level rebuild work is possible for the conscientious shade tree rebuilder. We offer nearly all parts at the component level, and our master rebuild kit, which includes the most thorough collection of parts offered anywhere. Our master rebuild kit has been assembled for our customer's rebuilds as well as our own. It is the most complete kit we've seen anywhere and features all the consumable and wear item components. Our exclusive intermediate shafts are made at Novak from a triple-alloy gear steel and case-hardened to exceptional hardness and are the strongest and hardest shafts available. They also feature o-ring grooves at both ends, assuring a better seal than factory; extra o-rings are also included. 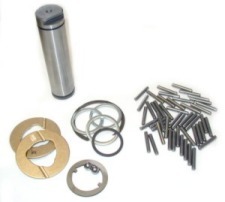 All kits include all the bearings, seals, gaskets, shims, small parts, intermediate shaft and comprehensive rebuild guide. This kit fits all Jeep Dana 20 Transfer cases and most IH Dana 20 transfer cases. NOT compatible with the Ford Bronco or other Dana 20 transfer cases. These kits are a reduced version of our Master Kits. They contain the specially hardened intermediate shaft, O-rings, thrust washers, bearings and snap ring. 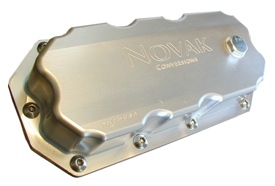 This extended capacity, billet bottom pan is the answer to a few Dana transfer case dilemmas. Its rigid construction replaces the thin, warped factory pans virtually assuring a drip-free seal and adds rigidity to the transfer case. Extended depth increases fluid capacity of the Dana transfer case by about 16 oz. extending the life of components within. The pan is made of corrosion resistant 6061 aluminum and then anodized clear for further protection. Compatible with Jeep, IH, and Chevy Dana 20 transfer cases. Will not fit a Bronco Dana 20. 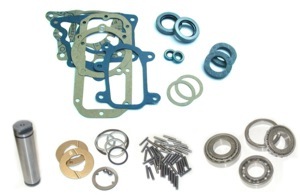 There's not a better gaskets and seals kit available. This one makes it possible to have a Dana 20 and a drip-free garage floor. The pan gasket itself (usually the most problematic) is cut from a rubber-cork compound. Essentially all parts for the Dana 20, including gears, shafts, etc. are available new and affordably so. Our parts ordering module is provided below. It is very common for our customers to do top-level rebuild work, using good methods and by following our included instruction guide. We suggest the rebuilder have access to a set of snap ring pliers, and a small arbor press, in addition to standard shop tools. The full rebuild procedure is covered here.